Many people who visit the Eco-Lodge think we have a little bit of paradise here. And it is true – it truly is a great place! However, there is a lot of work (and some adventures!) that goes on in the off season to make it all work. We are officially closed for the season now. So we get to use the Lodge as our private cottage. And do any maintenance we need. Normally, at this time of year, we have bare ground showing. This year we have 30cm of snow! We came in late last night, and discovered that our driveway was completely buried in snow. 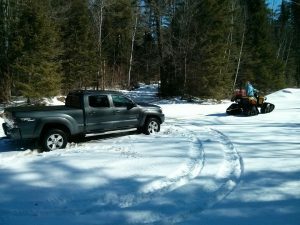 Well, we’re in a 4×4 truck with snow tires, so what can go wrong?? 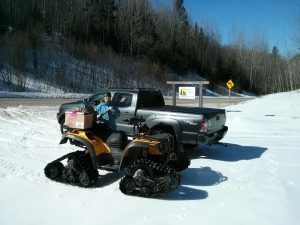 We drove the 1 km down the trail to our parking lot, and then got thoroughly stuck! We left the truck there, to deal with in the morning, grabbed the three cats and walked in to where we had a 6×6 ATV stashed. 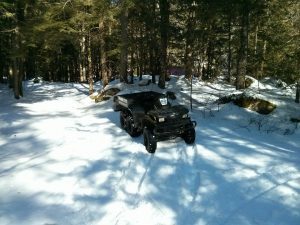 Even though it is six wheel drive, the snow was pretty deep. We managed to make it most of the way, but got stuck on the hill just before the Lodge. So the 6×6 is staying there for a few weeks until the snow melts. We grabbed the cats and walked the rest of the way to the Lodge. As soon as we got to the top of the hill we could hear wolves howling out on the lake! What a welcome! Needless to say, we stopped to have a listen, then hurried to get the cats inside before they became a snack! This morning we went out to deal with the stuck truck. Luckily, we have The Tank. Our ATV with tracks – it can go anywhere and pull anything. It took us a few tries, with the aid of tow ropes and shovels, but we managed to get unstuck. But, with the deep snow and warming weather, I decided we better get back to the road. Four wheel drive and full speed! It was like a mini rally race – had to keep up my momentum. Finally made it! All before breakfast. Made it back to the road! Might be time for a beer now!